The standard dash lights can be replaced with LEDs to increase brightness. I grabbed a pack of LEDs off eBay for around Â£3 delivered (via China) so it wasn't much of a gamble to try it out. 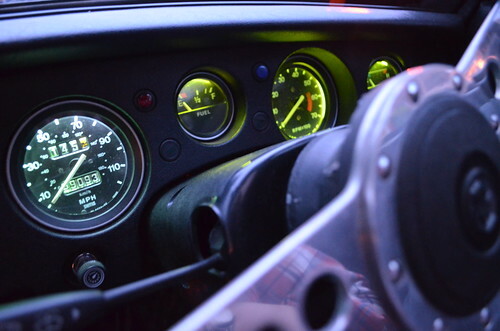 The holder position does seem to make a difference in the light which is allowed to get through - for example the oil pressure gauge didn't show any real difference with the LEDs, whereas the speedo was definitely different. The photos show the updated speedo compared to the standard fuel and rev counter (the green of the latter two seems accentuated in the photo). I'm not entirely convinced just swapping over the bulbs makes a huge amount of difference. To get the best out of it you'd probably have to repaint the inside of the gauges, but then that'd improve the standard bulbs too. For now I'm going to continue to run the standard bulbs - partly because I found that if the LEDs edges touch the gauge body they blow a fuse. This happened on the speedo and whilst the lights were unaffected, the speedo was dead until I replaced the fuse! Looking at the LEDs I'm not convinced they won't do this whilst in use, something I don't think is worth the trade-off for the amount I use them.